"Those who have ever witnessed a Waterspout will bear testimony to its appalling nature. One of these curious phenomena occurred on the Central Stage Road in Golden Gate Gulch, 4 miles above the town of Golden, on July 14 about 4 o'clock.... Presently a violent commotion, with confusion of sounds like the tumult of the elements, was heard high up in the mountains. Then came a tremendous torrent of water, bearing trees and boulders, and calculated to astonish and terrify by its magnitude, force and violence. The horses, seeing that they were to be sacrificed to the prodigious volume, took fright, and shying to one side upset the carriage and all occupants were pitched into the bottom of the gulch. In an instant, as it were, and before they [Mr. Jack Virden and family] could recover their feet, the wave, with a perpendicular breast of 10 or 12 feet, was upon them and licked them up like the sands of the gulch. Mrs. Virden clung to her husband, and he, by miraculous chance, got hold of a limb and held fast until the flood subsided..."
"Nothing like it had ever been witnessed before..."
"Before the rainfall even partially ceased, the water in the creek began to raise rapidly, bringing down flood-wood, railroad ties, trees and all manner of debris and to add to the horror, at about 8 o'clock a tremendous wall of water came down Tucker Gulch on the north side of Clear Creek, forcing its way through the center of town, carrying death and destruction in its path. At the point where the gulch debuches through a narrow passage in Clark's Garden Addition water marks show that the body of water must have been fully 30 feet deep." Three people were reported to have died in this flood. HEADLINE: "Golden Visited By Biggest Flood in Forty-five Years"
"A rain in the mountains to the north and west of Golden was estimated at from two to five inches and came within about a thirty-minute period. 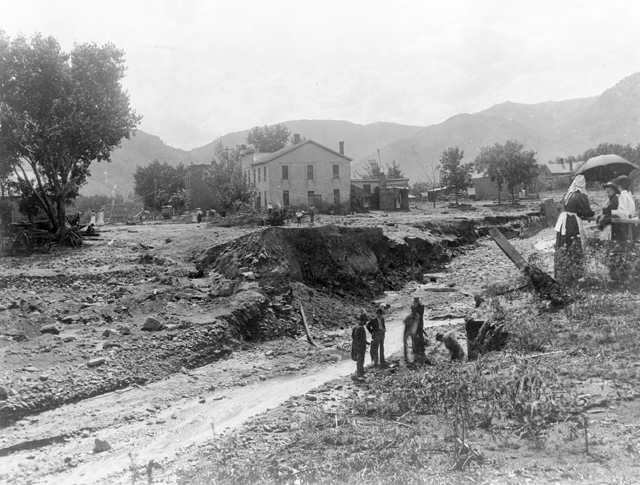 Soon afterwards Clear Creek, Tucker Gulch and its tributaries were raging torrents washing everything in its path..."
"In northeast Golden, one family was driven from their home, many others were put on guard to protect their property, at least two bridges were washed out, including the tramway bridge on 44th..."
"...Many of the homes in the Tucker Gulch section ~ere littered with debris and given a nice coating of mud. City street employees are credited with hauling 153 loads of mud from one block on 9th street, between Jackson and Ford. As the water left the banks of Tucker Gulch, it quickly filled the basement home of the Oppenlander family who escaped by crawling out of a window..."
"As the water reached sufficient heighth it overflowed into Ford street, some turned west on 9th, then south on Washington across the corner of the park, across the lawn of the Nazarene church and on into Clear Creek..."
"...Just below the Coors greenhouse, four head of cattle and a brown bear were washed upon shore, evidently they had come from several miles upstream." 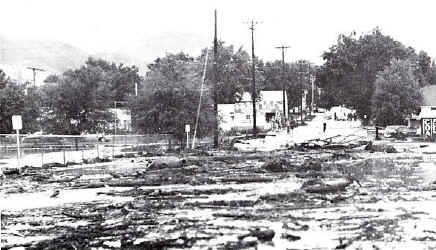 "The biggest loss, no doubt, was the extensive damage to the highway in Golden Gate canyon...."
HEADLINE: "Golden Flash Flood Damage Near $500,000"
Advance warning of the oncoming wall of water, telephoned to Golden and relayed by sheriff's radio and Golden's police department, is credited with having prevented any loss of life." 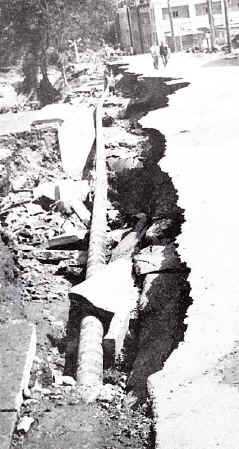 Photo #l. This photograph shows the structural damage sustained by the 10th Street bridge, formerly State Highway 58. 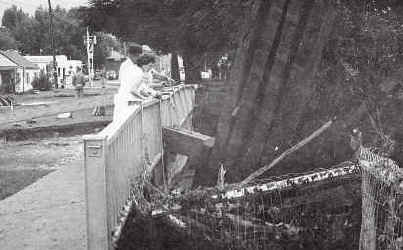 Major damage resulted from the force of a railroad trestle striking the bridge. The same trestle passed beneath the 9th Street bridge without causing damage. Photo #2. The debris which collected south of Clear Creek resulted from Tucker Gulch overtopping its banks between 9th and 10th Streets, forcing floodwaters down Ford Street and across the bridge. The Mitchell School property is located left of the photo and the old Safeway property is located to the right. The Coors Well ness Center currently exists where the Safeway Store was located in 1965. Photo #3. This photograph was taken from a location beneath the existing Highway 58 overpass. 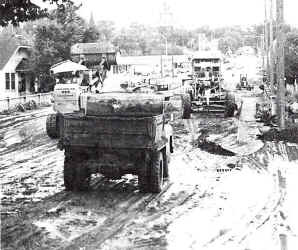 The 1965 flood occurred prior to the construction of the new highway. The Church Ditch siphon can be seen near the center of the photo. The building in the background is the Coors Porcelain Company. The exposed sanitary sewer line has been replaced by a new line running along the west side of Ford Street. Photo #4. The worker in the foreground is cleaning debris from the small culverts under the old road embankment. Boyd Street is in the background, along the top of the photo. The stream channel has been located to the west, since the 1965 flood. Today, Garden Street is located where this channel once existed. Photo #5. This photo was taken from approximately the same location as Photo #2. Clean up of mud and debris are in progress. Photo #6. This photo was taken from the north side of the Ford Street bridge and shows the same clean up operation as Photo #5. "Golden's Tucker Gulch, which is the drainage route from Golden Gate Canyon, became a galloping torrent of muddy water enroute to its junction with Clear Creek near the Coors Brewery. 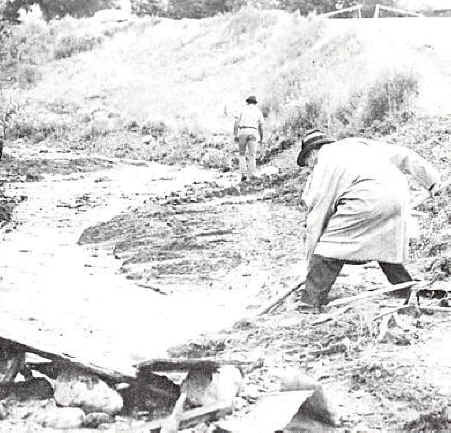 The gulch, which was channelized after a bad flood in 1965, seemed to be bearing up well under the onslaught of the waters into the early afternoon, but the dirt banks began to give way about 4 p.m. around 7th Street near the Colo. 58 overpass. "Another familiar source of flooding in Golden was Kinney Run, a gulch which drains part of Lockout Mountain and comes through Golden into Clear Creek. The relentless rain was too much for the most often dry gulch, and its waters spilled over onto Golden Road at a point next to the Lockout Mountain School for Boys. The water there joined with another torrent from south Table Mountain and closed down Ford and Jackson Streets for part of the day. Many homes in the area, particularly around Ford and Jackson at 21st, were badly hit by the rising waters, their basements filling up like bathtubs." 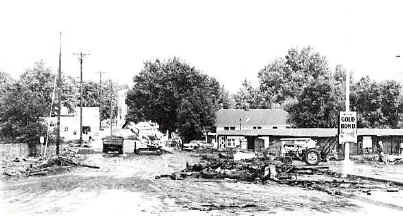 The preceding are examples of some of the most damaging floods experienced in Golden. It should be noted that many other floods have also inflicted damage Although only one newspaper article was found regarding flooding on Kenneys Run, local sources noted that the storm sewers commonly became plugged, forcing floodwaters down Jackson and Ford Streets.